It’s not the large cabochon gemstone that opens on a hinge to reveal a secret compartment filled with tasteless, odorless, deadly iocane powder of your imagination. This ring has a more subtle, and therefore effective, design. It’s made out of modest bronze and has a hollow cartridge welded to the bezel. It’s finely crafted with a circular granulation detail around the top and five cylinders that look like stacked pennies going up the side. There’s a small hole on the side of the ring between two of the cylinders through which poison could be introduced into the hollow chamber and, when the propitious moment is at hand, into the food or beverage of your benighted target. 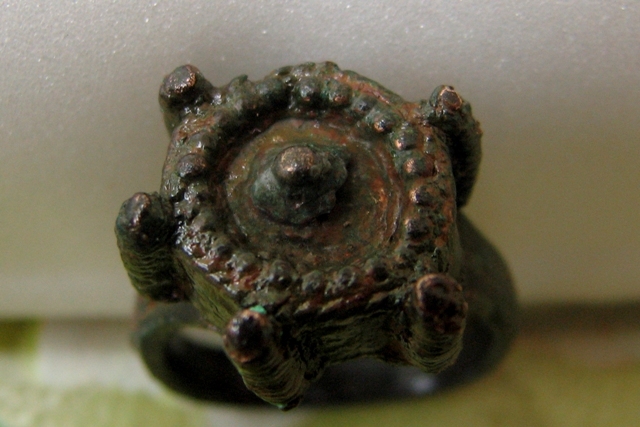 The ring was found by archaeologists excavating the remains of a 14th century fortress on Cape Kaliakra on the Black Sea about seven and a half miles from the town of Kavarna in northeast Bulgaria. Bulgaria’s National Institute of Archaeology has been excavating the fortress site since 2011. Amidst the remains of the 14th century walls, water pipes, baths and fortress, archaeologists have found more than 30 gold jewels, pearl earrings, rings set with precious and semiprecious gems. 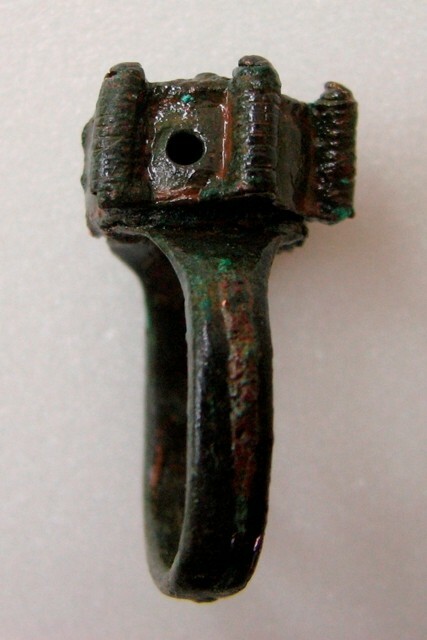 This ring is the only one made out of bronze discovered on the site. Some of the gold rings also have holes deliberately drilled in them, but only the ones with gemstones and none of them have hollow cartridges. According to team leader Boni Petrunova, holes were sometimes added to rings to allow the gems to “breathe.” The bronze ring is in excellent condition and intact as is. There were no gemstones in need of a breathing port, so that hole was used for other purposes, nefarious ones at that. The location certainly lends itself to deadly political machinations. Dobrudja was a center of wheat production for Byzantium and it had extensive trade networks with Italy and Spain through Genoa. That connection took an unpleasant turn on occasion, like when Genoese galleys dropped off the Black Death in 1346 or 1347 before carrying their Y. pestis-laden rat fleas to Sicily and thence to the rest of Western Europe. There was also plenty of local intrigue. Dobrotitsa and his son Ivanko had a dysfunctional relationship, to put it mildly. Their vicious rivalry left swaths of dead supporters in its wake. Perhaps this ring is responsible for some of that body count.